The Fed revealed how badly behind the curve it is on inflation yesterday. Put another way, if SEVEN rate hikes over a two year period are “accommodative,” REAL inflation is WELL above where rates are now. Remember, Jerome Powell is not a clueless academic like Janet Yellen or Ben Bernanke. Powell has ample experience in the private sector and is well aware that the Fed’s official inflation measures are garbage. 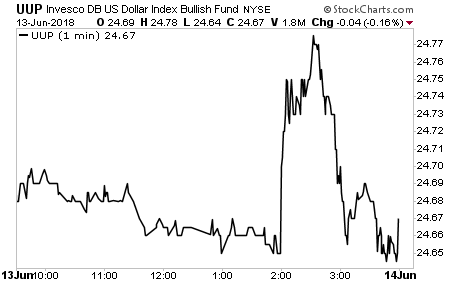 If you don’t believe me, consider how the actual markets reacted to the Fed statement. The $USD which SHOULD rally hard based on the Fed being hawkish gave up all its gains in just a few minutes. 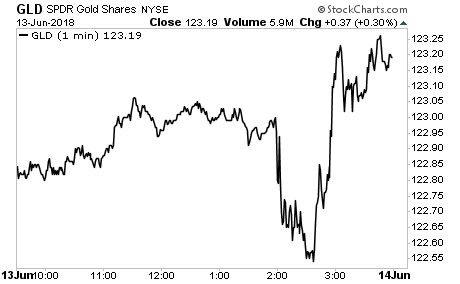 Meanwhile, Gold and other inflation hedges EXPLODED higher, finishing the day at the highs. Let me ask you... is a collapsing $USD and a strong Gold rally inflationary or deflationary? Remember the Fed has ready admitted its open to an "inflationary overshoot." Given how guarded the Fed typically is concerning real risks to the financial system (remember the "subprime is contained" gaffe in 2007?) this suggests the Fed is well aware inflation is going to be a REAL problem. On that note, we recently published a special investment report on how to profit from inflation. The report is titled Survive the Inflationary Storm. And it explains in very simply terms how to make inflation PAY YOU.